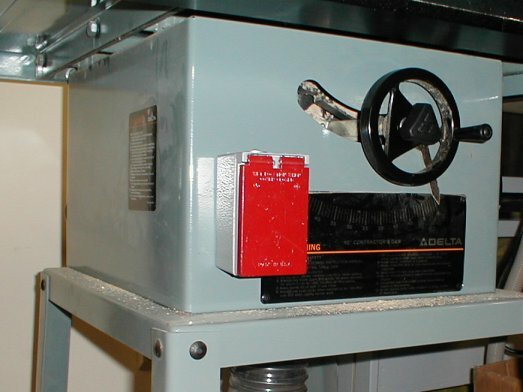 I hated the power switch on my Delta Contractor Saw. It was hard to operate and difficult to find in a hurry. I wanted something I could easily turn of (preferrably with my knee) and I did NOT want to spend $50 that Delta charges for one. My fix was an outdoor electrical box and an ordinary household rocker-style lightswitch. I think the pair set me back less than $10. 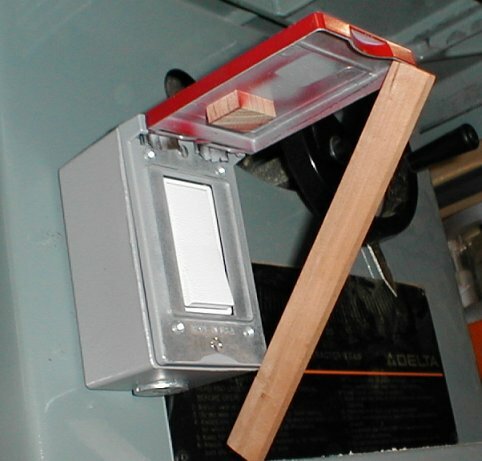 Glue a small block of wood under the cover over the off side of the switch so that pressing the cover will turn the switch off. I painted it red to make it easier to see. It is a bit of a pain to reach underneath to turn it on, but it's easier if the on side of the switch is down. Overall, I'm quite satisfied with the change. Unfortunately, I may need to change it when I rewire the motor for 220V. BTW, some people claim that a household lightswitch will not handle the inductive load of a large motor well...they say the switch will burn out...or short-circuit in the on position. This could be very dangerous...but I am skeptical. Only time will tell, I guess.